IG reported renewed activity at Sangay on 26 March based on satellite data and a Washington VAAC notice of ash. According to the VAAC a small ash plume rose less than 1 km above the crater rim and drifted SW. Seismicity had decreased to an average of three events per day after the last eruption ended on 7 December 2018, and then to 1 event per day during the past month. There was no seismic record of the 26 March event due to technical difficulties. Periodic eruptive activity at Ecuador's remote Sangay has included frequent explosions with ash emissions and occasional andesitic block lava flows. Eruptive activity from late March to mid-November 2016 included multiple ash emissions and persistent thermal signals through July 2016 (BGVN 42:08). A new episode of ash emissions and thermal anomalies, that began on 20 July 2017 (BGVN 42:08) and lasted through late October 2017, is covered in this report. Subsequent activity through February 2018 included a single ash-emission event near the end of the month. Information is provided by Ecuador's Instituto Geofísico (IG) and the Washington Volcanic Ash Advisory Center (VAAC); thermal data from the MODIS satellite instrument is recorded by the University of Hawaii's MODVOLC system and the Italian MIROVA project. The first ash plume of the latest eruptive episode at Sangay was reported on 20 July 2017. VAAC reports were issued on 20 and 21 July, eleven days in August, six days in September, and on 13 October. Thermal activity first appeared in a MIROVA plot during the last week of July and continued through 26 October. Multiple MODVOLC thermal alerts were issued between 2 August and 19 October. IG reported that low-energy ash emissions rising 1 km or less above the summit crater were typical throughout the period. They also repeatedly noted two distinct thermal hot spots in satellite data. A single ash emission on 25 February 2018 was the only additional activity through the end of February 2018. Activity during July-October 2017. The Washington VAAC reported an ash emission on 20 July 2017 that rose to 8.2 km altitude and drifted about 80 km W. A plume was reported on 1 August by the Guyaquil MWO near the summit at about 5.3 km altitude, but was obscured by clouds in satellite imagery. The following day an ash plume was observed at 7.6 km altitude centered about 15 km NW of the summit. An ash emission was reported on 6 August, but was not visible in satellite imagery. The MWO reported an ash emission on 12 August at 6.4 km altitude moving SW, but no ash was detected in satellite imagery under partly cloudy conditions. The Washington VAAC observed an ash plume on 13 August extending around 50 km SW at 6.1 km altitude and a well-defined hotpot. IG reported an ash emission drifting W on 16 August, but clouds obscured satellite views of the plume. Hotspots continued to be observed in shortwave infrared (SWIR) imagery. The Washington VAAC reported an ash plume at 8.2 km altitude on 17 August. The imagery showed an initial puff moving NW followed by several smaller puffs. On 19 August, the Guayaquil MWO reported an ash plume at 5.8 km altitude drifting SW. The next day, another explosion was reported with ash rising again to 5.8 km and drifting W, and a hotspot was observed in satellite imagery. The Washington VAAC reported a possible ash plume extending 30 km SW of the summit at 7 km altitude on 22 August. It had dissipated the next day, but they noted that a hotspot was visible in SWIR imagery. The next ash plume was reported by the MWO on 1 September at 5.2 km altitude but was not observed in satellite imagery. The next day, the Washington VAAC observed an ash plume at 6.1 km altitude extending 15 km NW of the summit. The Guayaquil MWO reported an ash plume to 7.3 km altitude on 6 September. On 20 September, a possible ash plume could be seen in GOES-16 imagery extending about 150 km W from the summit at 6.1 km altitude. Another plume extended 15 km SW from the summit later in the day at the same altitude. By the end of the day, continuous ash emissions were reported drifting W at 5.8 km altitude. The following day, occasional ash emissions were still reported drifting W and dissipating within 35 km of the summit. A new emission late on 21 September sent an ash plume 25 km W of the summit at 6.1 km altitude. Possible ongoing emissions were reported on 22 September, but not visible in satellite imagery. After three weeks of quiet, the Washington VAAC reported an ash emission on 13 October drifting S at 6.1 km altitude along with a bright hot spot visible for part of the day. This was the last report of ash emissions for 2017. The eruption that began on 20 July 2017 was characterized by explosions from the central crater and lava emissions from the Ñuñurco dome on the E side of the summit. IG reported two areas of hot spots visible in thermal images during August and September. Around 65 seismic explosions and 25 long-period events were recorded daily during most of this time, along with a few harmonic tremors. Low-energy ash emissions rising 1 km or less above the summit crater were typical. Ashfall was reported to the SW and NW in Culebrillas (75 km SW), and Licto (35 km NW). New lava flows were interpreted to be on the ESE flank by IG based on the repeated hot spots visible in satellite imagery and darkened areas in the snow in the webcam images (figure 20). Figure 20. A dark streak in the snow near the summit (left side, arrow) of Sangay indicates recent ejecta of blocks or flows on the upper ESE flank of the cone on 1 October 2017. 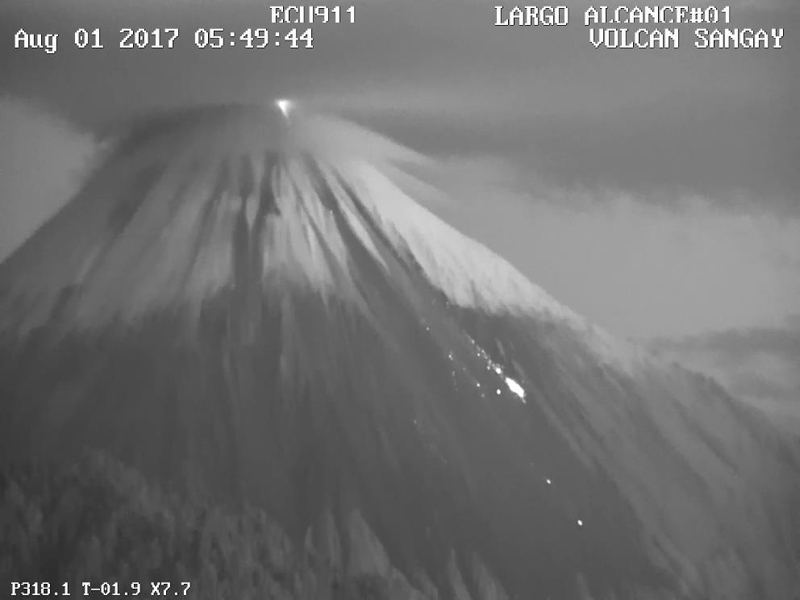 View is from the ECU911 webcam located in Huamboya, 40 km E. Courtesy of IG-EPN (Informe Especial del Volcán Sangay, 2017-2, Continúa la erupción, se observan dos ventos, 4 de octubre del 2017). Thermal activity measured from satellite instruments support the interpretation of significant lava emissions as blocks or flows at Sangay during late July-October 2017. The MODVOLC system reported 11 thermal alerts beginning on 14 August, 15 during September, and 13 between 3 and 19 October. A similar signal of thermal activity was recorded by the MIROVA system during the same period (figure 21). Figure 21. The MIROVA project graph of thermal anomalies in MODIS data from Sangay for the year ending on 17 November 2017 (lower graph) clearly shows the period of increased heat flow between late July and late October. The last anomaly appeared on 26 October 2017 (upper graph). Courtesy of MIROVA. Activity on 25 February 2018. The Washington VAAC reported an ash plume rising to 6.1 km altitude and drifting NE from the summit on 25 February 2018. The plume was visible 170 km NE before dissipating by the end of the day. Information Contacts: Instituto Geofísico (IG), Escuela Politécnica Nacional, Casilla 17-01-2759, Quito, Ecuador (URL: http://www.igepn.edu.ec ); Washington Volcanic Ash Advisory Center (VAAC), Satellite Analysis Branch (SAB), NOAA/NESDIS OSPO, NOAA Science Center Room 401, 5200 Auth Rd, Camp Springs, MD 20746, USA (URL: www.ospo.noaa.gov/Products/atmosphere/vaac, archive at: http://www.ssd.noaa.gov/VAAC/archive.html); Hawai'i Institute of Geophysics and Planetology (HIGP) - MODVOLC Thermal Alerts System, School of Ocean and Earth Science and Technology (SOEST), Univ. of Hawai'i, 2525 Correa Road, Honolulu, HI 96822, USA (URL: http://modis.higp.hawaii.edu/); MIROVA (Middle InfraRed Observation of Volcanic Activity), a collaborative project between the Universities of Turin and Florence (Italy) supported by the Centre for Volcanic Risk of the Italian Civil Protection Department (URL: http://www.mirovaweb.it/). IG reported that the eruption at Sangay that began on 8 August ended on 7 December after about four months of activity. The eruption was characterized by the extrusion of lava flows, and ash emissions that rose between 0.5-1.4 km (and occasionally higher than 2 km) and mainly drifted W and NW. Minor amounts of ash fell in Guayaquil on 18 September. Lava flows traveled 1-2 km down the ESE flank, and both block avalanches and possible small pyroclastic flows from the flow fronts traveled additionally as far as 7 km. IG reported that since 8 August activity at Sangay was characterized by the extrusion of lava flows on the ESE flank and ash emissions that rose between 500 and 1,500 m and mainly drifted W and NW. Lava flows were 1-2 km long, though block avalanches from the flow fronts traveled additionally as far as 5 km. The seismic network recorded more than 50 signals per day indicating explosions. The activity continued at least through 21 November; the report noted that this phase has lasted longer than any other since 2015. Based on satellite images and wind model data, the Washington VAAC reported that during 19-20 September ash emissions from Sangay rose to 5.8-6.1 km (19,000-20,000 ft) a.s.l., drifted WNW and W, and became diffuse after 37 km. Based on satellite images and wind model data, the Washington VAAC reported that on 11, 13, 15, and 17 September ash emissions from Sangay rose to 5.8-6.4 km (19,000-21,000 ft) a.s.l. and drifted SW and W. A thermal anomaly was visible each day, and also on 16 September. Based on satellite images and wind model data, the Washington VAAC reported that during 28 August-3 September ash emissions from Sangay rose to 5.8-6.7 km (19,000-22,000 ft) a.s.l. and drifted over 45 km in multiple directions. A thermal anomaly was sometimes visible. The Washington VAAC reported that on 8 June a possible discrete ash emission from Sangay rose to an altitude of 5.8 km (19,000 ft) a.s.l. and drifted 28 km WSW before dissipating. Based on information from the Guayaquil MWO, the Washington VAAC reported that on 12 August an emission from Sangay rose to altitudes of 6.1-6.4 km (20,000-21,000 ft) a.s.l. and drifted SW and NW. Ash in the emission was not detected in satellite data. On 13 August satellite data showed a well-defined thermal anomaly over the volcano, and an ash plume drifting 55 km SW.
Based on Washington VAAC reports, IG noted two ash plumes on 20 July and one on 2 August that rose 2.3-3 km above the crater and drifted W and NW. Numerous thermal anomalies detected during 2-3 August were aligned on the ESE flank. Based on numerical weather prediction (NWP) models, satellite data, and information from the Guayaquil Meteorological Watch Office (MWO), the Washington VAAC reported that on 6 August an ash plume drifted W.
Based on information from the Guayaquil MWO, the Washington VAAC reported that on 1 August an emission from Sangay rose to an altitude of 5.3 km (17,500 ft) a.s.l. and drifted W.
Based on satellite images and wind data, the Washington VAAC reported that on 16 July a possible ash plume from Sangay rose to an altitude of 5.8 km (19,000 ft) a.s.l. and drifted 22 km SW.
Based on satellite images and notices from the Guayaquil MWO, the Washington VAAC reported that during 27 April-3 May ash plumes from Sangay rose to altitudes of 5.8-7 km (19,000-23,000 ft) a.s.l. and drifted as far as 120 km WNW, W, and S. A thermal anomaly was identified in satellite images during 29-30 April and on 2 May. The Washington VAAC reported that on 15 April an intermittent thermal anomaly was identified in satellite images over Sangay. No ash was detected in images, though seismic data indicated activity. On 19 April the Guayaquil MWO indicated that an ash plume rose to an altitude of 6.1 km (20,000 ft) a.s.l. and drifted W.
Based on satellite images and notices from the Guayaquil MWO, the Washington VAAC reported that on 1 April an ash plume from Sangay rose to an altitude of 6.7 km (22,000 ft) a.s.l. and drifted SW. The next day an ash plume rose to an altitude of 5.5 km (18,000 ft) a.s.l., and a continuing thermal anomaly was detected. On 4 April satellite images detected an ash plume that drifted about 18 km N at an altitude of 5.5 km (18,000 ft) a.s.l. Based on notices from the Guayaquil MWO, the Washington VAAC reported that on 25 March an ash plume from Sangay rose to an altitude of 6.1 km (20,000 ft) a.s.l. and drifted W. On 27 March a pilot observed an ash plume rising to an altitude of 7.6 km (25,000 ft) a.s.l. and drifting W. The next day an ash plume rose to an altitude of 6.4 km (21,000 ft) a.s.l. and drifted WSW. Cloud cover prevented satellite observations of the volcano on all three days. IG reported that tremor at Sangay ceased on 10 March and the number of long-period earthquakes began to decline the next day. The number of explosions per day increased (from a maximum of four during 3-11 March) to 10 on 12 March, peaked at almost 110 on 15 March, and then declined to 50 on 17 March. Cloud cover prevented views of the volcano though the seismic data suggested that gas-and-ash emissions were produced; ashfall was not reported in towns downwind. At 0400 on 17 March continuous tremor with interspersed bursts of more intense tremor began to be detected. The activity intensified at 1300, and then began to gradually decline. IG noted that climbers should avoid the volcano during periods of increased activity. IG reported that the seismic network at Sangay started to record sporadic seismic events on 5 March, although seismicity became more notable during 8-9 March; signs of small explosions and volcano-tectonic events were detected on 7 March, and long-period signals emerged on 9 March. An explosion signal was followed by harmonic tremor on 9 March. That same day satellite images detected a thermal anomaly and an emission that drifted S.
Based on a SIGMET notice of a pilot observation, the Washington VAAC reported that on 26 February an ash plume from Sangay rose to an altitude of 7.3 km (24,000 ft) a.s.l. Satellite images only detected an intermittent thermal anomaly. According to the VAAC, on 27 February IG reported a lava flow and a possible diffuse ash plume that rose to an altitude below 5.5 km (18,000 ft) a.s.l. within 15 km of the summit. On 2 March a local pilot observed an ash plume that rose to an altitude of 7.6 km (25,000 ft) a.s.l. On 3 March an ash plume rose to an estimated altitude of 5.2 km (17,000 ft) a.s.l. and drifted 13 km W.
Based on a pilot observation, the Washington VAAC reported that on 4 February an ash plume from Sangay rose to an altitude of 6.7 km (22,000 ft) a.s.l. Satellite images showed a possible ash plume drifting less than 20 km SW. A thermal anomaly was visible in satellite images the next day, as well as a diffuse plume with possible ash drifting W.
According to the Washington VAAC, a thermal anomaly on Sangay was detected in satellite imagery during 4-6 July. According to the Washington VAAC, a pilot observed an ash plume from Sangay on 22 March that rose to an altitude of 8.2 km (27,000 ft) a.s.l. Cloud cover prevented satellite observations. Based on analyses of satellite imagery, the Washington VAAC reported that on 25 October a gas plume from Sangay, which possibly contained ash, drifted 75 km E. Ash was not identified in subsequent images. The Washington VAAC reported that on 23 February a pilot observed ash from Sangay. No ash was confirmed in a small cloud identified in satellite imagery drifting SSE. Based on analyses of satellite imagery, the Washington VAAC reported that on 27 January small ash clouds from Sangay drifted N and quickly dissipated. Based on a pilot observation, the Washington VAAC reported that on 12 January an ash plume from Sangay rose to an altitude of 6.7 km (22,000 ft) a.s.l. and possibly drifted more than 45 km SW. A thermal anomaly was detected in satellite imagery. Based on information from Guayaquil MWO, the Washington VAAC reported ash from Sangay on 5 December; weather clouds prevented satellite observations. IG noted elevated seismicity. The Washington VAAC reported that on 14 October a pilot noted an ash plume from Sangay; however, an analysis of satellite imagery revealed only gas plumes drifting NW. The Washington VAAC reported that on 21 September an ash plume from Sangay rose to an altitude of 7.6 km (25,000 ft) a.s.l. and was observed by a pilot. Ash was not seen in satellite imagery, although weather clouds were in the area. The Washington VAAC reported that on 10 September a small plume and a thermal anomaly from Sangay were seen in satellite imagery. Based on information from Tegucigalpa MWO, pilot observations, and analyses of satellite imagery, the VAAC reported that on 13 September small plumes of gas with possible ash drifted SW. A thermal anomaly had also been detected for the previous few hours. Based on analyses of satellite imagery, the Washington VAAC reported that on 19 August small ash-and-gas plumes from Sangay drifted about 25 km W and dissipated. Intermittent thermal anomalies were also detected. On 20 August a pilot reported an emission that was not seen in satellite imagery. Based on pilot observations and analyses of satellite imagery, the Washington VAAC reported that on 21 July an ash cloud from Sangay drifted W. During 22-23 July, diffuse plumes drifted 65-115 km W. Occasional thermal anomalies were detected by satellite imagery on 21 and 23 July. The Washington VAAC reported that on 6 May an ash plume from Sangay was seen by a pilot. Ash was not identified in satellite imagery, but a diffuse steam-and-gas plume was seen before weather clouds moved into the area. Based on pilot observations, the Washington VAAC reported that on 22 February an ash plume from Sangay rose to an altitude of 7.6 km (25,000 ft) a.s.l. Ash was not identified in satellite imagery. Based on pilot observations, the Washington VAAC reported that on 2 February an ash plume from Sangay rose to an altitude of 8.2 km (27,000 ft) a.s.l. Ash was not identified in satellite imagery, although weather clouds were present in the area. Based on pilot observations, the Washington VAAC reported that on 18 and 21 December ash plumes from Sangay rose to an altitude of 7.9 km (26,000 ft) a.s.l. and drifted W. Ash was not identified in satellite imagery, although weather clouds were present in the area. Thermal anomalies were occasionally detected in the satellite imagery. Based on a pilot observation, the Washington VAAC reported that on 1 December an ash plume from Sangay rose to an altitude of 7.9 km (26,000 ft) a.s.l. and drifted W. Ash was not identified in satellite imagery, although low weather clouds were present in the area. Later that day, an eruption was reported, but ash was again unidentifiable in satellite imagery. Based on analyses of satellite imagery, the Washington VAAC reported that on 16 November small plumes from Sangay, possibly with ash, drifted WNW. A thermal anomaly was also detected. Based on analyses of satellite imagery, the Washington VAAC reported that on 15 October a small plume from Sangay drifted 15 km SW.
Based on a pilot observation, the Washington VAAC reported that on 23 July a possible ash plume from Sangay rose to an altitude of 7.9 km (26,000 ft) a.s.l. The plume was not identified in satellite imagery. Based on a pilot observation, the Washington VAAC reported that on 26 June an ash plume from Sangay rose to an altitude of 7.6 km (25,000 ft) a.s.l. The suspected ash was seen on satellite imagery drifting less than 30 km W.
Based on pilot observations, the Washington VAAC reported that on 9 February a plume from Sangay rose to an altitude of 7.9 km (26,000 ft) a.s.l. No ash was identified on satellite imagery, but meteoric clouds were also present in the area. Based on analysis of satellite imagery, the Washington VAAC reported that a small gas-and-steam plume with some ash rose from Sangay on 16 December. Based on analysis of satellite imagery, information from the Guayaquil MWO, and pilot reports, the Washington VAAC reported that a minor ash plume rose from Sangay on 24 September and drifted WNW. Based on observations of satellite imagery and pilot reports, the Washington VAAC reported that an ash plume from Sangay rose to an altitude of 6.1 km (20,000 ft) a.s.l. on 26 December and drifted SW. A thermal anomaly was seen on satellite imagery during 26-27 December. Based on observations of satellite imagery and pilot reports, the Washington VAAC reported that an ash plume from Sangay rose to an altitude of 7 km (23,000 ft) a.s.l. on 12 October and drifted W.
The Washington VAAC reported that ash plumes from Sangay were observed by pilots during 8-9 September. Ash was not detected on satellite imagery. Based on pilot observations, the Washington VAAC reported that an ash plume from Sangay drifted SSE on 19 August. Observations using satellite imagery were inhibited due to cloud cover. Based on pilot observations, the Washington VAAC reported that an ash plume from Sangay rose to an altitude of 5.5 km (18,000 ft) a.s.l. and drifted W on 2 August. Ash was not detected on satellite imagery. Based on pilot observations, the Washington VAAC reported that an ash plume from Sangay rose to an altitude of 6.7-8.2 km (22,000 to 27,000 ft) a.s.l. on 28 July. Ash was not detected on satellite imagery but a weak hotspot could be seen. Based on pilot observations, the Washington VAAC reported that an ash plume from Sangay rose to an altitude between 5.2-7.9 km (17,000-26,000 ft) a.s.l. and drifted W on 3 July. Based on pilot observations, the Washington VAAC reported that an ash plume from Sangay rose to altitudes of 5.2-7.6 km (17,000-25,000 ft) a.s.l. on 4 May. On 5 May, a possible narrow ash plume was visible on satellite imagery drifting W.
Based on information from IG, the Washington VAAC reported that an ash plume from Sangay was present on 22 March. The altitude and drift direction of the plume were not reported. Based on information from the Guayaquil MWO and satellite imagery, the Washington VAAC reported that an eruption from Sangay on 28 February produced an ash plume that rose to an altitude of 7.6 km (25,000 ft) a.s.l. On 2 March, a diffuse plume and a weak hotspot were seen on satellite imagery. On 5 March, a pilot reported that an ash plume rose to between 5.2-6.1 km (17,000-20,000 ft) a.s.l. and drifted W.
Based on information from Guayaquil MWO, the Washington VAAC reported that an eruption from Sangay on 28 January produced an ash plume that rose to an altitude of 6.4 km (21,000 ft) a.s.l. Based on information from Guayaquil Meteorological Watch Office (MWO) and satellite imagery, the Washington VAAC reported that an eruption from Sangay on 1 January produced an ash plume that rose to an altitude of 5.2 km (17,000 ft) a.s.l. Based on a pilot report, the Washington VAAC reported that an ash plume from Sangay rose to an altitude of 7.6 km (25,000 ft) a.s.l. on 23 December. Based on pilot reports and satellite imagery, the Washington VAAC reported that an eruption from Sangay on 2 December produced an ash plume that rose to an altitude of 8.5 km (28,000 ft) a.s.l. and drifted SW. According to the Washington VAAC, an eruption from Sangay on 22 November produced an ash plume observed on satellite imagery that drifted WNW. Based on a pilots report, the Washington VAAC reported that ash from an eruption at Sangay produced a plume to a height of ~6 km a.s.l. on 1 May at 1750. Ash was not visible on satellite imagery. "Continual quiet eruption. Much explosive activity. Smoke plume leaves crater every 20-30 minutes. No data about flows or ejecta." Information Contacts: Minard Hall, Escuela Politécnica Nacional, Quito. The following represents a brief description of the continuing volcanic activity of the almost unknown and inaccesible volcano El Sangay. A scientific group visited the volcano during the week of 24 May to 1 June 1975. New blocky lava flows, that began before February 1975, continue advancing down the west side of this composite cone. The flows apparently originate in the summit crater (5,160 m) as suggested by the brilliant red glows seen in the crater at night and by occasional small explosions and blasts of dark gray smoke that are quickly dispersed by the high winds. The flows descend to about 3,800 m where they have fanned out and probably cover ~2 km2 in total area. The flow rock appears to be a basaltic andesite with olivine phenocrysts; milky white quartz xenocrysts are notably abundant to the total exclusion of all other types of inclusions. The summit crater appears to be formed by at least two vents, one of which is emitting white clouds of vapor and sulfurous fumes almost continuously and another which emits infrequent blasts of dark gray clouds. The crater rim was continually being sandblasted by fine volcanic sand and ash, coming from the vents below, but no larger ejecta were observed. The strength of the fumes and the lack of visibility precluded a reconnaissance of the summit vents. The west side (leeward side) of the volcano is covered by an approximate 70-m-thick sequence of thinly-bedded ashes, which probably corresponds to the renovation of activity in the 1940's after a 15 year dormancy. Since the 1940's the activity has been more Strombolian, marked by very muld but continuous ash eruptions and occasional lava flows. Evidence of past lahar activity is everywhere. The recent activity of El Sangay presents no danger to man. A recent expedition, 28 July-9 August, to the stratovolcano Sangay reports the following activity. Mild explosive activity occurred at intervals of 6-12 hours with the expulsion of white, vapor-rich, sulfurous plumes that rose approximately 100 m. Very acidic rains were falling W of the cone. The NW side of the cone was covered by still-hot lava flows (basaltic andesite) from the last few years. A new lava flow was leaving the S crater and has descended W several hundred meters. A light coating of ash covered the snow on the SW side of the cone. No other activity was observed on the other sides of the volcano. It appeared that this activity has continued steadily from last year. A small parasitic cone of approximately 50 m height was recently discovered on the lower E flank. It is not presently active. On 10 August an independent British team, which apparently included no geologist, reached the 3,700 m basecamp level on the volcano. Two days later six members ascended to within 300 m of the summit. At 1230 an explosion produced a black mushroom cloud that reached an estimated 300 m above the volcano and dropped ejecta (to 35 cm) on the group. Later, search parties found three injured, one dead, and another had not been found 5 days after the accident. Helicopter rescue attempts were abandoned on 18 August after two days of heavy snowfall. Information Contacts: M. Hall, Escuela Politécnica Nacional, Quito; J. Aucott, British Embassy, Quito.
. . . During overflights on 4 and 6 August, Maurice Krafft observed frequent ash emission from 1 of 4 WSW-ENE-trending vents in the summit area. The westernmost vent was filled by a blocky lava dome 15-20 m in diameter, partially covered by ash. ENE of the dome, explosions at least every 10 minutes from a 15-m-diameter crater produced thick black cauliflower-shaped ash columns 100-300 m high. Winds blew ash from these explosions to the SW, toward the dome. Each explosion also triggered small ash avalanches from deposits on the upper W and SW flanks. The largest of the four vents, ENE of the active crater, was 80-100 m across and contained two fumaroles that were emitting vapor. The fourth vent, 20-30 m in diameter and slightly N of the trend of the other 3 vents, was not active during the overflights. Minard Hall reported that activity was generally similar when he visited the volcano in 1976. Although lava was oozing from the westernmost vent at that time, it had not yet built a dome. Information Contacts: M. Krafft, Cernay, France; M. Hall, Escuela Politécnica, Quito. Geologists from GEVA visited the volcano in June and August. Throughout June, only summit fumarolic activity was noted, but in early August, explosions every 5 minutes ejected small ash clouds. A warning was issued to aircraft flying in the vicinity of Sangay on 4 August at 2249. On 11 August, a new lava flow extended from the summit ~ 200 m below the crater rim. Blocks from the crumbling flow front rolled down the W and SW flanks to 4,400 m altitude. Larger avalanches from the flow front were observed on 12 August between 1400 and 1500. At 0005 on 13 August, explosions from a S-flank vent covered the volcano's S slope with red-hot lava blocks up to 1 m in diameter. Explosions ejecting blocks and ash continued until 0900. By 1600, the flow had moved to ~ 400 m below the crater rim and numerous blocks fell from the two lobes of the flow front. Information Contacts: J. Durieux, GEVA, Lyon, France; G. Heiken, LANL, Los Alamos. From 24 November to 12 December 1995, the first detailed study of Sangay volcano (figures 1 and 2) was carried out by an Instituto Geofísico/ORSTOM team (Escuela Politécnica Nacional, Quito), with helicopter support from the Ecuadorian Army and the assistance of five local guides from Alao. During this time, activity was characterized by continuous fumarolic steaming, frequent phreatic explosions, occasional crater glow, and dome rockfalls. Previous reports from August 1976, August 1983, and June-August 1988 (SEAN 01:10, 08:07, and 13:08) identified four summit vents aligned WSW-ENE, which are here numbered from 1 to 4 going from W to E.
Figure 1. Present cone of Sangay in December 1995 viewed from the base camp 4.3 km SW. The recent pyroclastic-flow deposit on which the campsite is located is in the foreground, among the badlands corresponding to an older edifice. At the summit can be seen the W lava dome (Vent 1) and its now inactive lava tongues. Photo by M. Monzier, courtesy of ORSTOM. Figure 2. View of the Sangay summit in December 1995 looking NE from the base camp showing the lava dome and associated lava flows from Vent 1. Behind this dome, a steam plume rises from the main crater (Vent 3). Photo by M. Monzier, courtesy of ORSTOM. In 1976, Vent 1 consisted of a fracture from which lava was slowly issuing, but by August 1983 it had built a lava dome. This small dome was apparently more active in August 1988, and sent a lava flow 400 m down the W flank, where it split into two lobes. 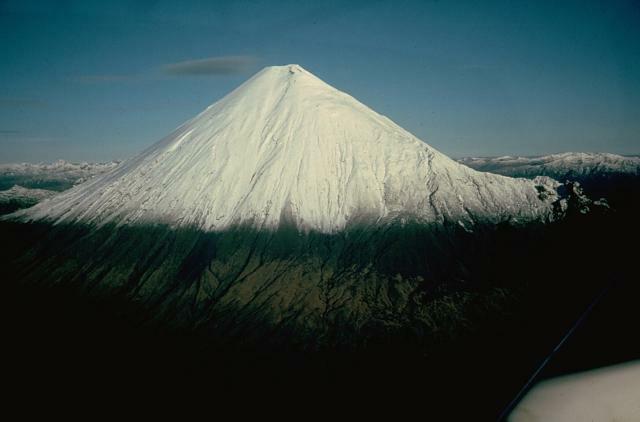 In late 1995 this dome was possibly still growing, and was the source of some fumarolic activity and many rockfalls, making the W and SW slopes of the cone dangerous to cross. Apparently there have been no new lava flows from this vent since August 1988. Vent 2, a small 15-m-diameter crater immediately ENE of Vent 1 has frequently been the site of explosive activity (1976 and 1983), but apparently was less active in 1988 and was quiet during the 1995 visit. The ENE crater (Vent 4) remained inactive but with occasional fumarolic activity. Vent 3, at 80-100 m across, is the largest and deepest crater. In 1976 and 1983 only fumarolic activity was observed from this crater, but lava was reported in 1988. During the 1995 visit it was the site of frequent phreatic explosions, some separated by hours, others coming as often as every 26 minutes. Several explosions were followed by a rhythmic, pulsating roar that lasted for up to 50 oscillations. White vapor plumes, ejected with the audible explosions, rose several hundred meters above the summit. Light blue gas plumes and occasional red glow at night immediately above this crater implied the presence of lava. Frequent rockfalls from the upper S flank of the cone suggested that some lava may be escaping, breaking off, and rolling down the S slopes. During the visit a portable MEQ-800 Sprengnether seismograph with a vertical, 1-Hz L4C geophone was operated at the La Playa base camp, 4.3 km SW of the main crater at 3,600 m elevation. A preliminary study of the smoked-paper seismograms showed three types of seismic signals, frequently associated with observed explosions in the crater (figures 3 and 4): tremor, long-period, and hybrid events. Tremor events had a monochromatic signature with a period of 1 second and lasted < 60 seconds. The long-period events had emergent arrivals and a constant period of ~0.7 seconds; they were often associated with observed explosions. Hybrid events began with a long-period event (0.7 seconds) and were followed by a signal similar to that of the tremor (1 second). Some hybrid events were associated with audible and observed explosions followed by a roar like pulsating, rhythmic exhalations. No local high-frequency events were detected. Figure 3. Types of volcanic earthquakes at Sangay recorded by the seismic station 4.3 km SW in December 1995. Courtesy of ORSTOM. Figure 4. Volcanic seismicity recorded at Sangay, 26 November-10 December 1995. Courtesy of ORSTOM. Recent lavas and pyroclastic-flow, debris-flow, and lahar deposits are ubiquitous around the cone and testify to Sangay's nearly continuous activity. The site of the La Playa camp (figure 5) is on an andesitic pyroclastic-flow deposit containing bombs up to 4 m in diameter which was emplaced between 1956 and 1965. An accident with two fatalities happened in August 1976 (SEAN 01:10). A previously unreported accident occurred in December 1993 when the main crater exploded just as two mountaineers looked over its rim. Both were blinded by the heat and fragment impacts and remained lost in the jungle on the cone's lower slopes until rescued three days later. Figure 5. Preliminary geological/structural map of Sangay volcano based on fieldwork, aerial photographs, and 1:50,000 topographic maps from the Instituto Geografico Militar, Quito. Key: M = metamorphic formations; I, II, III = successive volcanic edifices; C1 and C2 = avalanche calderas; AD = avalanche deposits. Campsites are shown as black dots (La Playa = basecamp, Z = Zumbacocha and D = Duende are secondary camps). In addition to the present cone (Sangay III), two previous edifices were identified and sampled, both of which had been destroyed by collapse. The remnant calderas are found on the E side of the present cone and are breached E toward the Amazon plain. Their probable avalanche deposits lie at the E foot of the cone. A preliminary geologic map of Sangay (figure 5) shows the three successive edifices and the two associated calderas. Edifice I is mainly built of lava, whereas edifices II and III contain both lava and pyroclastic deposits. The products of edifices I and II appear to be more varied in composition (greater differentiation) than those of Sangay III, where mafic andesites seem to predominate. This isolated stratovolcano E of the Andean crest is one of Ecuador's most active volcanoes having been in frequent eruption for the past several centuries. The steep-sided glacier-covered volcano towers above the tropical jungle on the E side; on the other sides heavy rains have caused plains of ash to be sculpted into steep-walled canyons up to 600 m deep. The first historical eruption was reported in 1628, and more or less continuous eruptions took place from 1728 until 1916, and again from 1934 to the present. Information Contacts: M. Monzier and C. Robin, ORSTOM, A.P. 17-11-6596, Quito, Ecuador; M. Hall, P. Mothes, and P. Samaniego, Instituto Geofísico, Escuela Politécnica Nacional, A.P. 17-01-2759, Quito, Ecuador. Our previous report was in 1996 (BGVN 21:03); this report covers the time interval January 2004 to January 2006. According to a 2004 annual summary on the Instituto Geofísico (IG) website, Sangay was one of the most active volcanoes in Ecuador, and has been in eruption for ~ 80 years. Its isolated location (figure 6) has meant it has been thought of as a relatively small hazard risk. For this reason, monitoring has been less than for other Ecuadorian volcanoes. Thermal, visual, and satellite monitoring during 2002-2004 confirmed the central crater as the source of frequent explosions and continuing steam-and-gas emissions. Figure 6. Satellite imagery showing the region around the city of Riobamba (center) in Ecuador), including Sangay (lower right), Chimborazo (upper left), Tungurahua (upper right), and Licto (center) volcanoes. An eruption plume can be discerned coming from Tungurahua, but the date of the image is unknown. The city of Riobamba is about 50 km NW of Sangay. Courtesy of Google Earth. During 2004 observers did not see lava flows or pyroclastic flows. An abnormally large eruption cloud was detected on 14 January 2004; it contained dominantly steam and gases, with minor ash content. Although only clearly detected and reported then, such events are thought to occur with considerable frequency. Ramon and others (2006) summarized Sangay's activity as continuously erupting since 1934. Thermal images taken during the last three years showed that only one of the three summit craters was active and documented a lack of new, visible lava flows. On 14 January 2004 a plume from Sangay was observed around 0500. The plume extended about 45 km E and most likely contained ash. During this time a hotspot was also visible on the satellite imagery. On 27 January 2004 a narrow ash plume emitted by Sangay rose to 6 km altitude and drifted SW.
On 1 May 2004, based on a pilot's report, the Washington VAAC noted that ash from an eruption at Sangay produced a plume to a height of ~ 6 km altitude at 1750. Ash was not visible on satellite imagery. On 28 December 2004 around 0715 a plume from Sangay, most likely composed of steam with little ash, was detected. The plume was E of the volcano's summit at a height of ~ 6.4 km altitude. A hotspot was prominent on satellite imagery, but ash was more difficult to distinguish. On 16 October 2005 around 0645 Sangay emitted an ash plume. The plume moved SSW very slowly, corresponding to a possible height of ~ 6.7 km altitude. By 0900 the plume was too thin to be visible on satellite imagery and thunderstorms developed in the area, further obscuring the ash cloud. Based on information from the IG, on 26 October 2005 the Washington VAAC noted that ash was seen over Sangay at 0758. No ash was visible on satellite imagery. Climber's photo journal. Climbers Thorsten Boeckel and Martin Rietze created a website briefly describing a trek to Sangay's summit during 4-12 January 2006. Several of their posted photos from that trip appear here (figures 7-10; unfortunately, the photos, which are strikingly beautiful, were generally presented without much geographic context). The team included at least one local guide and was aided by horses. Settlements on the approach and return included the mountain village St. Eduardo, which they described as ~ 50 km S of Riobamba. Figure 7. A vista of Sangay at nightfall in early January 2006. Direction of view is approximately WNW. Photo credit to Boeckel and Rietze. Figure 8. Photograph documenting the climbers tent camp high on the snowbound slopes of Sangay during their descent. Exact location on Sangay unknown; this was labeled "day 4/5," and should correspond to 7 or 8 January 2006. Photo credit to Boeckel and Rietze. Figure 9. A topographic high forming part of the Sangay structure, gently steaming, apparently seen from the summit. This corresponds to 7 or 8 January 2006. Photo credit to Boeckel and Rietze. Figure 10. A crater on Sangay as seen by the climbers from the summit or upper flanks, described by them as the "snow covered east crater." This photo corresponds to 7 or 8 January 2006. Photo credit to Boeckel and Rietze. Except for some degassing, the group saw no other activity. Although local residents indicated that the last eruption had occurred about 2 months prior to their visit, intermittent eruptions pose hazards to climbers; in 1976 two climbers were killed by explosions from Sangay (SEAN 01:10). Reference. Ramón, P., Rivero, D., Böker, F., and Yepes, H., 2006, Thermal monitoring using a portable IR camera: results on Ecuadorian volcanoes in "Cities on Volcanoes IV"; 23-27 January 2006. Information Contacts: P. Ramón, Instituto Geofísico-Departamento de Geofísica (IG), Escuela Politécnica Nacional, Casilla 17-01-2759, Quito, Ecuador; Washington Volcanic Ash Advisory Center (VAAC), Satellite Analysis Branch (SAB), NOAA/NESDIS E/SP23, NOAA Science Center Room 401, 5200 Auth Rd, Camp Springs, MD 20746, USA (URL: http://www.ospo.noaa.gov/Products/atmosphere/vaac/); Thorsten Boeckel and Martin Rietze, c/o Kermarstr.10, Germerswang, D-82216, Germany (URL: http://www.tboeckel.de/). Our previous report on Sangay (BGVN 21:03) described occasional, but sometimes conspicuous, steam and/or ash plumes between January 2004 and January 2006. The current report continues coverage of plume emissions through December 2007. Sangay has continued to erupt, sending ash plumes up to an altitude of about 11 km. A summary of plume activity is indicated in table 1. The information is from the Washington Volcanic Ash Advisory Center (VAAC), and is based on reports from the Guayaquil Meteorologic Watch Office, pilot reports, satellite imagery, and the Instituto Geofísico-Departamento de Geofísica (Escuela Politécnica Nacional). We did not receive any report of activity during the period February 2006 through September 2006, or during the first three months of 2008. Table 1. Ash plume advisories about Sangay activity, October 2006 through December 2007. Courtesy of the Washington VAAC. According to a report from the Instituto Geofísico, activity at Sangay increased at the end of 2006 through the beginning of 2007. They reported that a thermal anomaly was detected by satellite imagery during several days in December 2006. During that time, mountain guides near the volcano observed the fall of incandescent rocks down the volcano's flanks at night and a recent deposit of ash that was sufficiently deep to affect birds, rabbits, and other small animals. The report indicated that the Instituto Geofísico has not installed monitoring instrumentation near Sangay because of a significant logistics problem in maintaining them in this inhospitable area, and also because the area is uninhabited and thus poses no direct human risk. However, the report notes that because ash emissions from Sangay may pose problems for aircraft in the S, SE, and SW parts of the country, the Instituto maintains contact with the civil aviation authority. Information Contacts: Washington Volcanic Ash Advisory Center, Satellite Analysis Branch (SAB), NOAA/NESDIS E/SP23, NOAA Science Center Room 401, 5200 Auth Rd, Camp Springs, MD 20746, USA (URL: http://www.ospo.noaa.gov/Products/atmosphere/vaac/); P. Ramón, Instituto Geofísico-Departamento de Geofísica (IG), Escuela Politécnica Nacional, Casilla 17-01-2759, Quito, Ecuador. Ash plumes were reported between October 2006 and December 2007 (BGVN 33:03). Thermal anomalies have been detected between 27 March and 4 December 2008 (table 2). A minor ash plume was seen on satellite imagery and by pilots drifting WNW on 24 September 2008. Table 2. Thermal anomalies at Sangay based on MODIS-MODVOLC imaging during 1 January to 19 October 2008 (continued from the list in BGVN 33:03). No thermal anomalies were noted in 2008 prior to 27 March. Courtesy of Hawai'i Institute of Geophysics and Planetology (HIGP) Thermal Alerts System. Information Contacts: Washington Volcanic Ash Advisory Center, Satellite Analysis Branch (SAB), NOAA/NESDIS E/SP23, NOAA Science Center Room 401, 5200 Auth Rd, Camp Springs, MD 20746, USA (URL: http://www.ospo.noaa.gov/Products/atmosphere/vaac/); Hawai'i Institute of Geophysics and Planetology (HIGP) Thermal Alerts System, School of Ocean and Earth Science and Technology (SOEST), University of Hawai'i, 2525 Correa Road, Honolulu, HI 96822, USA (URL: http://modis.higp.hawaii.edu/). Our most recent reports on Sangay noted occasional steam and/or ash plumes between 11 October 2006 and 28 December 2007 (BGVN 33:03) and thermal anomalies between 27 March and 4 December 2008 (BGVN 34:01). The current report continues to tabulate this persistently erupting volcano's plumes from 28 December 2007 to 31 July 2009 (table 3), and thermal anomalies from 4 December 2008 to 10 August 2009 (table 4). Table 3. Sangay ash plume activity, reported for 29 December 2008 to July 2009. NR signifies not reported and no plumes were observed 29-31 December 2008. TA is thermal anomaly. Courtesy of the Washington Volcanic Ash Advisory Center. Table 4. Thermal anomalies at Sangay based on MODIS-MODVOLC data during 4 December 2008 to 10 August 2009 (continued from the list in BGVN 34:01). Courtesy HIGP Thermal Alerts System. Information Contacts: Washington Volcanic Ash Advisory Center, Satellite Analysis Branch (SAB), NOAA/NESDIS E/SP23, NOAA Science Center Room 401, 5200 Auth Rd, Camp Springs, MD 20746, USA (URL: http://www.ospo.noaa.gov/Products/atmosphere/vaac/); Hawai'i Institute of Geophysics and Planetology (HIGP) Thermal Alerts System, School of Ocean and Earth Science and Technology (SOEST), Univ. of Hawai'i, 2525 Correa Road, Honolulu, HI 96822, USA (URL: http://modis.higp.hawaii.edu/). Sangay, which has been in near constant eruption for centuries, continued its eruptive activity into 2010. Previous reports on Sangay (BGVN 33:03, 34:01, and 34:06) had documented occasional ash plumes through 31 July and thermal anomalies through 10 August 2009. After almost two months with no indications of observed by satellite, both plumes and thermal anomalies resumed on 4 October 2009 (tables 5 and 6). Intermittent observations of plumes and MODVOLC thermal alerts were made every month afterwards through February 2010. Table 5. Sangay ash plumes recorded during August 2009-February 2010. TA indicates a thermal anomaly noted by a VAAC analyst. No plumes were observed during 24 July-3 October 2009. Courtesy of the Washington Volcanic Ash Advisory Center (VAAC). Table 6. Thermal alerts issued for Sangay by the MODVOLC system during August 2009-February 2010 (continued from the list in BGVN 34:06). Courtesy HIGP Thermal Alerts System. The last report discussed observations of ash plumes and MODVOLC thermal alerts at Sangay through February 2010 (BGVN 35:01). Intermittent reporting indicated that similar activity continued through at least February 2011, with plumes reaching up to 7.6 km altitude (table 7). Clouds obscured the view at times, and plumes were reported primarily by pilots and were sometimes visible on satellite imagery. Table 7. Plumes reported at Sangay during April 2010-February 2011. No plumes were noted during March 2011. Courtesy of the Washington VAAC. On 5 December 2010, the Washington Volcanic Ash Advisory Center (VAAC) stated that Instituto Geofisico reported elevated seismicity. The MODVOLC alert system issued thermal alerts for Sangay monthly during March 2010 through early October 2010. Then, alerts were absent until 11 January 2011 (table 8). Table 8. Thermal alerts issued for Sangay by the MODVOLC system during March 2010-20 March 2011 (continued from the list in BGVN 35:01). The system uses the MODIS instrument on the Terra and Aqua satellites. Courtesy MODVOLC Thermal Alerts System. Information Contacts: Washington Volcanic Ash Advisory Center (VAAC), Satellite Analysis Branch (SAB), NOAA/NESDIS E/SP23, NOAA Science Center Room 401, 5200 Auth Rd, Camp Springs, MD 20746, USA (URL: http://www.ospo.noaa.gov/Products/atmosphere/vaac/); Hawai'i Institute of Geophysics and Planetology (HIGP) MODVOLC Thermal Alerts System, School of Ocean and Earth Science and Technology (SOEST), Univ. of Hawai'i, 2525 Correa Road, Honolulu, HI 96822, USA (URL: http://modis.higp.hawaii.edu/). Previously reported activity from Sangay volcano (figure 11) included ash plumes and elevated temperatures (BGVN 36:01). In this report, we note that similar activity persisted during August 2011-May 2013. We highlight low-level unrest that was primarily detected with remote sensing instruments and pilot reports. Figure 11. This GoogleEarth image of Sangay includes an inset (below) from Landsat 7 acquired on 16 September 2001. The exaggerated blue color distinguishes the snow-and-ice covered summit from regional clouds (white with magenta in locations where the cloud is thinning). Note the gray area in the SE sector, an eruptive event had recently occurred that covered (or potentially melted) the typically symmetrical snowcover. The scale bar is approximate. Courtesy of GoogleEarth and USGS/NASA. Ash plumes during 2011-2013. Notices from the Washington Volcanic Ash Advisory Center (VAAC) during this reporting period were primarily based on pilot reports and a weather station located in Guayaquil (MWO). There were seven significant plumes visible with satellite images; those plumes reached altitudes of altitudes 6-8 km a.s.l. (table 9). Ash plumes drifted to a maximum distance of 20 km from the summit. A 25 January 2012 report from Instituto Geofísico-Escuela Politécnica Nacional (IG) (Special Report No. 01-2012) stated that activity at Sangay had intensified since 23 January. Pilot reports on 23 January were noted by the Washington VAAC with observations of ash moving SSE. Satellite images from 24 January noted thermal anomalies. Table 9. Washington VAAC reports for Sangay during August 2011-May 2013. The following abbreviations are used: volcanic ash (VA) and meteorological watch observatory (MWO). No VAAC reports were released during June-August 2013, the remaining duration of this report. Courtesy of VAAC. 28 Jul 2012 small emission 7 km W Pilot report; in satellite images a small burst of gas through cloud layers was observed. 11 Apr 2013 ash plume 6 km W Visible satellite images showed a VA plume; event should dissipate over the next 3 hours. 26 Apr 2013 ash plume 8 km SW 9 km/h A couple of weak VA emissions within 20 km of the summit; a hotspot was observed in images. Elevated temperatures from the summit. Modvolc detected hotspots from February 2010 to early May 2013 (table 10). The elevated temperatures were detected around the summit area with as many as 3 pixels but typically one pixel per observation (figure 12). Hotspots were no longer visible after 4 May through August 2013. Table 10. 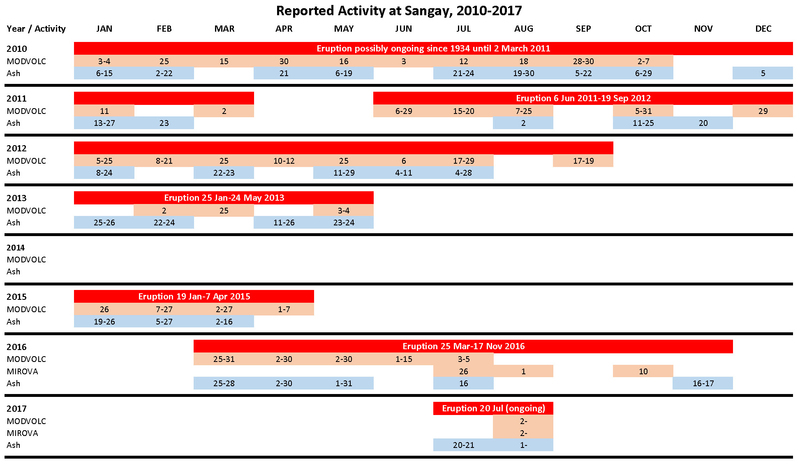 Hotspots from the region of Sangay were detected consistently during February 2010 through early May 2013. The Modvolc system uses the MODIS instrument on the Terra and Aqua satellites. Courtesy MODVOLC Thermal Alerts System. Figure 12. From 4 May 2013 to 4 May 2012, Modvolc detected 11 hotspots in the region of Sangay. These elevated temperatures were centered on and located within 3 km of the summit area. Courtesy of HIGP. Satellite images during 2012-2013. Significant cloudcover in the region of Sangay prohibited clear satellite views of volcanic activity. In Figure 13, four images were chosen for relatively unobstructed views, however, due to technical problems with a sensor onboard Landsat 7, black bands interfere with the images. Despite these challenges, bright snow is easily distinguished from the summit area and the disruptions of the typically white (altered to blue for higher contrast) summit suggest processes such as ashfall, lahars, or melting causing new exposures of underlying rock. Ash events were frequently documented as late as 23 May 2013 and it is clear in the 8 August 2013 image that the summit snow was no longer significantly disturbed. Figure 13. Satellite images from Landsat 7 (12 July 2012, 10 April 2013, and 26 April 2013) and Landsat 8 (8 August 2013) captured views of the changing conditions at Sangay. Snow and ice at the summit appears as bright blue while cloudcover is typically white with some magenta fringes; recent ashfall, lahars, or melting events have disrupted the symmetrical snow region in these images except for the image from 8 August 2013. Courtesy of USGS/NASA. References. NASA Landsat Program, 2001, Landsat ETM scene L71010061_06120010916, SLC-Off, USGS, Sioux Falls, Sept. 16, 2001. NASA Landsat Program, 2012, Landsat ETM scene LE70100612012194ASN00, SLC-Off, USGS, Sioux Falls, July 12, 2012. NASA Landsat Program, 2013, Landsat ETM scene LE70100612013100EDC00, SLC-Off, USGS, Sioux Falls, April 10, 2013. NASA Landsat Program, 2013, Landsat ETM LE70100612013116EDC00, SLC-Off, USGS, Sioux Falls, April 26, 2013. NASA Landsat Program, 2013, Landsat ETM scene LC80100612013220LGN00, SLC-Off, USGS, Sioux Falls, August 8, 2013. Information Contacts: Instituto Geofísico-Escuela Politécnica Nacional (IG), Casilla 17-01-2759, Quito, Ecuador (URL: http://www.igepn.edu.ec/); Washington Volcanic Ash Advisory Center (VAAC), Satellite Analysis Branch (SAB), NOAA/NESDIS E/SP23, NOAA Science Center Room 401, 5200 Auth Rd, Camp Springs, MD 20746, USA (URL: http://www.ospo.noaa.gov/Products/atmosphere/vaac/); and Hawai'i Institute of Geophysics and Planetology (HIGP) MODVOLC Thermal Alerts System, School of Ocean and Earth Science and Technology (SOEST), Univ. of Hawai'i, 2525 Correa Road, Honolulu, HI 96822, USA (URL: http://modis.higp.hawaii.edu/). Previously reported activity from Sangay volcano (figure 11) included ash plumes as late as 23 May 2013 and satellite infrared thermal alerts ending in early May 2013 (BGVN 36:01). In that previous report, satellite thermal alerts from the MODVOLC system were noted to have persisted and as late as 4 May 2013. That lack of alerts continued as late as 16 July 2013 when the MODVOLC website was last checked. Since that reporting, there have been no new updates regarding Sangay on the website of the Instituto Geofisico (IG), the aviation reports have not mentioned Sangay, and other news of Sangay behavior has also been generally lacking. Figure 11. (Inset at bottom) A regional map showing Sangay with respect to large rivers and other features surrounding Sangay. Orange line is the PanAmerican highway, which passes near Río Bamba on the map's N. Major rivers (blue) are primary routes of lahars. (Main map) A hazards map for Sangay made with hazards focus and compiling the results of multiple kinds of modeling. Key (in Spanish) notes that the upper three colors were based on slope angle (H/L) with text noting gradation of hazards in those regions from pyroclastic flows, lava flows, ash falls, volcanic bombs, rock falls, and proximal lahars. The lower three colors on the key represent inferred gradations of lahar hazard at distance from the volcano. Dashed envelopes in red refer to boundaries for small and moderate sizes of ash falls. White line shows inferred boundary for an E directed debris avalanche. Base map is from the Instituto Geografico Militar (IGM). Taken from an online poster by Ordóñez and others, 2014). Absence of MODVOLC and aviation alerts does not necessarily translate to a lack of eruptions. The MODVOLC system imposes a reasonably high threshold to the infrared data acquired from space. Factors such as weather conditions, snow pack, and geometry of the vent area may play a role. Emissions of spatter, ash fall, and small pyroclastic flows could easily be missed. Assessments are generally best made in conjunction with information at the volcano. The current eruption began on 8 August 1934 and is thus far confirmed only through 23 May 2013. Hazard modeling and products. In late 2013 to early 2014 IG released a poster discussing Sangay hazards (Ordóñez and others, 2014), some of the results of which we reprint here (figures 11, 12, and 13). Figure 11 contains IGEPN's recently published a map of volcanic hazards associated with Sangay, which resides in the Cordillera Real between the cities of Río Bamba and Macas. The IG and others have generally considered Sangay one of the most active volcanoes in South America. The poster noted historical records of its eruptive activity dating back to 1628 (Hall, 1977) and in the last century some important periods of activity were recorded during 1903, 1934-1937, 1941-1942, 1975-1976, and 1995 to the present (Monzier et al.. 1999). Observations of surface activity carried out in the past 40 years allowed scientists to recognize some important morphological changes at the summit of the volcano, including the emergence of new craters, dome growth, extrusion of lava flows, local explosions and ash emissions, and relatively small pyroclastic flows. Figure 12. Modeled ash fall blanket from a hypothetical eruption at Sangay of moderate size. The key (in Spanish) refers to the colors in the key and on the isopach map, with thicknesses in millimeters. Taken from an online poster by Ordóñez and others (2014). Figure 13. Modeled ash fall blanket from a hypothetical eruption at Sangay of large size. The key (in Spanish) refers to the colors in the key and on the isopach map, with thicknesses in millimeters. Taken from an online poster by Ordóñez and others (2014). A larger suite of volcanic hazards models is not shown here but includes results VolcFlow. Ash3D, Tephra2, and LAHARZ. The data used for the simulations were obtained from the few geological studies in this volcano (Hall, 1977; Monzier et al, 1999; Johnson et al, 2003). Sangay is judged in some ways analogous to Tungurahua volcano, because of its chemical composition, and it similar lava rheology and eruptive style of volcanic flows. During August-September 2013, IG installed seismic monitoring instruments (broad band and infrasound ) and for the measurement of sulfur dioxide (SO2) in the southwestern flank of the volcano Sangay. These tools facilitate the monitoring of internal and surface activity of the volcano which will give an early warning of a potential hazards. With regard to monitoring, during August-September 2013 IG personnel installed ~4 km southwest of Sangay volcano, permanent telemetered monitoring system consisting of a broadband seismic sensor, infrasound, and gas monitoring. References. Bonadonna, C, Connor CB, Houghton BF, Byrne M, Laing A, Hincks T., 2005, Probabilistic modeling of tephra dispersal: Hazard assessment of a multi-phase eruption at Tarawera, New Zealand; J. Geophys. Res., 110, B03203. Hall M. (1977). El Volcanismo en Ecuador. Publicación del Instituto Panamericano de Geografía e Historia, Sección nacional del Ecuador, Quito. 120pp. Mastin, L, Schwaiger H, Denlinger R., 2012, User's Guide to Ash3d: A 3-D Eulerian Atmospheric Tephra Transportation and Dispersion Model, U.S. Geological Survey Open File Report. Monzier M, Robin C, Samaniego P, Hall M, Cotten J, Mothes P, Arnaud N., 1999, J. Volcanol. Geotherm. Res. 90, 49-79. Ordóñez J., Vallejo S., Bustillos J., Hall M., Andrade D., Hidalgo S., and Samaniego P., (Document created, December 2013; Accessed online July 2014), Volcan Sangay---Peligros Volcanicos Potenciales, Instituto Geofísico, Escuela Politécnica Nacional (IG-ESPN) (URL: http://www.igepn.edu.ec/volcan-sangay/mapa-de-peligros.html ). Schilling S. (1998). LAHARZ: GIS programs for automated mapping of lahar-inundation hazard zones. US Geological Survey Open-File Report 98-638; 79 pp. 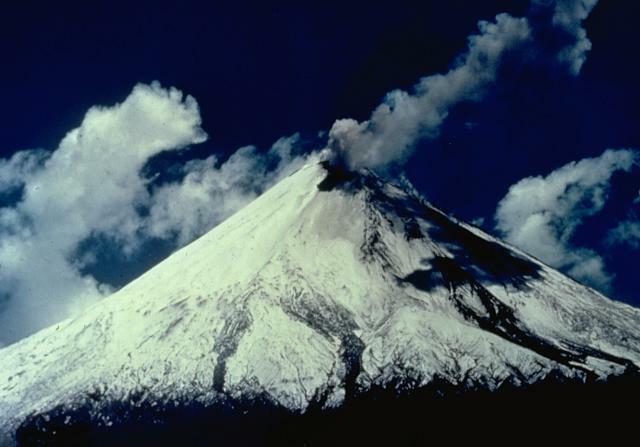 Ecuador's Sangay, isolated on the east side of the Andean crest, has exhibited frequent eruptive activity over the last 400 years. Its remoteness has made ground observations difficult until recent times, and thus most information has come from aviation reports from the Washington Volcanic Ash Advisory Center (VAAC) and MODIS (Moderate Resolution Imaging Spectroradiometer) satellite-based data. Thermal anomaly information is reported by the University of Hawaii's MODVOLC system and the Italian MIROVA Volcano HotSpot Detection System. Ecuador's Instituto Geofísico (IG) issues periodic Special Reports of activity. This report summarizes the intermittent nature of the eruptions from 2011-2013, and covers renewed activity during January 2015 through July 2017. Summary of activity during 2011-2013. Activity during 2011 (figure 14) began with a continuation of the intermittent ash emissions and thermal anomalies that persisted throughout 2010 (BGVN 36:01). Ash plumes during January and February 2011 were reported at typical altitudes between 6 and 8 km; thermal alerts appeared once each during January and March. No activity was reported after 2 March until a new series of thermal alerts began more than 3 months later on 6 June 2011; they were intermittent from then through 19 September 2012, with reports occurring during 1-4 days of all but three months. Ash emissions were also intermittent during this time, with VAAC reports issued during eight of the months from 2 August 2011-28 July 2012 for plumes reported at altitudes of 6-8 km. They also generally occurred during 1-4 days of the month. A four-month break in activity followed until ash plumes were reported on 25 January 2013; they were intermittent until 24 May 2013. MODVOLC thermal anomalies were also reported during this time, on 2 February, 25 March, and 3-4 May. Figure 14. Summary chart of ash emissions and thermal anomalies reported from Sangay during January 2010 to early August 2017. Red bars show eruptive periods where there are reports of either ash plumes or thermal anomalies without a lack of observed activity for more than 3 months. Rows with pink cells indicate dates with thermal anomalies (MODVOLC or MIROVA). Rows with blue cells indicate dates with ash emissions as reported by the Washington VAAC. A range of dates means that activity occurred at least on those two dates, but may not have been continuous. Data courtesy of Washington VAAC, HIGP MODVOLC Thermal Alerts System, and MIROVA. Summary of activity during January 2015-July 2017. After 19 months of quiet from June 2013 through December 2014, an ash plume reported on 19 January 2015 marked the beginning of a new eruptive episode that included ash plumes, lava flows, and block avalanches between 19 January and 7 April 2015. The next reported activity included both ash emissions and thermal anomalies observed almost a year later on 25 March 2016, although IG had reported increases in seismicity during the previous two weeks. Ash emissions and thermal anomalies were intermittent through 16 July 2016. There was a single thermal anomaly seen in MIROVA data on about 10 October and a brief ash emission occurred during 16-17 November 2016, after which Sangay was quiet until a new episode started on 20 July 2017 that was ongoing into August. Activity during January-April 2015. After a 19-month period of no reported activity (since May 2013), ash emissions were again seen beginning on 18 January 2015 when an ash plume rose to 6.4 km altitude and drifted SW. Additional plumes on 25 January and 4 February rose to 7.3 km and 6.7 km, respectively, and drifted less than 20 km SW (figure 15). Ash plumes primarily observed by pilots between 27 February and 16 March were generally not visible in satellite images due to weather clouds. During this episode, MODVOLC thermal alerts were reported on 26 January; 7, 21, 23 and 27 February; 2,4,18, and 27 March; and 1, 3, and 7 April. Figure 15. Ash emission at Sangay sometime during 19-26 January 2015. The ash plume eventually reached about 2 km above the 5,286-m-high summit crater. Photo by Gustavo Cruz, courtesy of IG (Informe Especial del Volcan Sangay No 1, 16 March 2015). In a March 2015 report, IG noted that new lava flows and block-avalanche deposits had been emplaced during January and February 2015. The lava flows descended the SE flank about 900 m (figure 16). Two areas of deposits from block avalanches and ashfall extended 2.5 km ESE from the lava front, and 1.5 km down the S flank. According to IG, there were 21 thermal anomalies identified in MIROVA during 31 January-25 February 2015. Figure 16. Locations of lava flows and block-avalanche deposits at Sangay that were emplaced during January and February 2015. The new lava flows are shown in red. The ash and block-avalanche deposits are shown in stippled yellow/green. 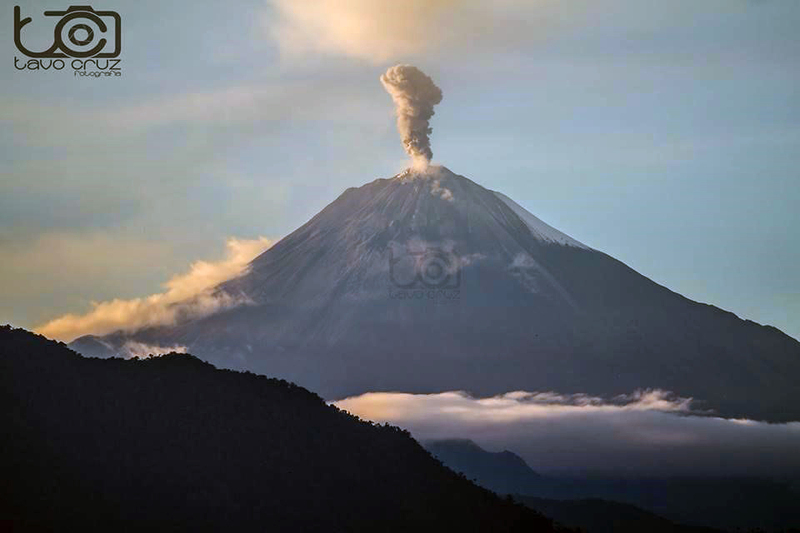 Courtesy of IG (Informe Especial del Volcan Sangay No 1, 16 March 2015). Activity during March-November 2016. IG reported an increase in seismicity on 5 March 2016, after ten months of no reported activity. An explosion signal was followed by harmonic tremor on 9 March, and IG noted that both a thermal anomaly and an emission drifting S were identified in NOAA satellite images. They inferred that increased seismic "explosion" signals on 14 March were indicative of ash-and-gas emissions, although weather clouds prohibited visual confirmation. Ash emissions rising to 6.1 km altitude were first reported by the Guayaquil MWO on 25 March 2016; they noted two more emissions on 27 and 28 March rising to similar altitudes (7.6 and 6.4 km, respectively), but cloudy weather prevented satellite confirmation. Plumes reported on nine days during April rose to similar altitudes (ranging from 5.5-7 km) and extended 18-30 km N or NW from the summit. A series of daily emissions occurred from 30 April-7 May. The emissions included a plume on 2 May that extended 120 km NW, and one on 6 May that rose to 8.2 km altitude and extended approximately 55 km SW before dissipating. Ash-bearing plumes were reported on 10 more days during the rest of May. Although no more ash plumes were reported until 16 July 2016, MODVOLC thermal alerts were persistent every month beginning on 25 March and lasting through 5 July (see figure 14 above). The MIROVA data for this period also clearly show persistent thermal anomalies (figure 17). A short-lived eruption event during 16-17 November 2016 consisted of an ash emission that rose to 6.1 km altitude and drifted as far as 290 km SE. Figure 17. Thermal anomaly data from MIROVA for the year ending on 18 January 2017 at Sangay, showing the eruptive episode of March-July 2016, and a brief anomaly on about 10 October 2016; late October-November anomalies are more than 20 kilometers from the summit and unrelated to volcanism. Courtesy of MIROVA. Activity beginning July 2017. A new eruptive episode began on 20 July 2017, after eight months without major surface activity. Low-energy ash emissions rising to 3 km above the crater, incandescent block avalanches on the ESE flank (figure 18), and a possible new lava flow were reported by IG. The Washington VAAC reported an ash emission on 20 July rising to 8.2 km altitude and drifting about 80 km W. A plume was reported on 1 August by the Guyaquil MWO but obscured by clouds in satellite images, and a plume on 2 August was seen in webcam images (figure 19). Figure 18. Incandescent blocks roll down the ESE flank of Sangay during the early morning of 1 August 2017. Courtesy of IG (Informe Especial del Volcán Sangay-2017-No 1, 3 August 2017). Figure 19. Ash emission at Sangay on 2 August 2017, with the plume rising about 400 m above the summit crater drifting SW. Courtesy of IG (Informe Especial del Volcán Sangay-2017-No 1, 3 August 2017). Information Contacts: Instituto Geofísico (IG), Escuela Politécnica Nacional, Casilla 17-01-2759, Quito, Ecuador (URL: http://www.igepn.edu.ec/); Washington Volcanic Ash Advisory Center (VAAC), Satellite Analysis Branch (SAB), NOAA/NESDIS OSPO, NOAA Science Center Room 401, 5200 Auth Rd, Camp Springs, MD 20746, USA (URL: http://www.ospo.noaa.gov/Products/atmosphere/vaac/, archive at: http://www.ssd.noaa.gov/VAAC/archive.html); Hawai'i Institute of Geophysics and Planetology (HIGP), MODVOLC Thermal Alerts System, School of Ocean and Earth Science and Technology (SOEST), Univ. of Hawai'i, 2525 Correa Road, Honolulu, HI 96822, USA (URL: http://modis.higp.hawaii.edu/); MIROVA (Middle InfraRed Observation of Volcanic Activity), a collaborative project between the Universities of Turin and Florence (Italy) supported by the Centre for Volcanic Risk of the Italian Civil Protection Department (URL: http://www.mirovaweb.it/). The isolated Sangay volcano, located east of the Andean crest, is the southernmost of Ecuador's volcanoes and its most active. The steep-sided, glacier-covered, dominantly andesitic volcano grew within horseshoe-shaped calderas of two previous edifices, which were destroyed by collapse to the east, producing large debris avalanches that reached the Amazonian lowlands. The modern edifice dates back to at least 14,000 years ago. It towers above the tropical jungle on the east side; on the other sides flat plains of ash have been sculpted by heavy rains into steep-walled canyons up to 600 m deep. The earliest report of a historical eruption was in 1628. More or less continuous eruptions were reported from 1728 until 1916, and again from 1934 to the present. The almost constant activity has caused frequent changes to the morphology of the summit crater complex. This volcano is located within the Sangay National Park, a UNESCO World Heritage property. Johnson J B, Lees J M, 2000. Plugs and chugs--seismic and acoustic observations of degassing explosions at Karymsky, Russia and Sangay, Ecuador. J. Volcanol. Geotherm. Res., 101: 67-82. Monzier M, Robin C, Samaniego P, Hall M L, Cotten J, Mothes P, Arnaud N, 1999. 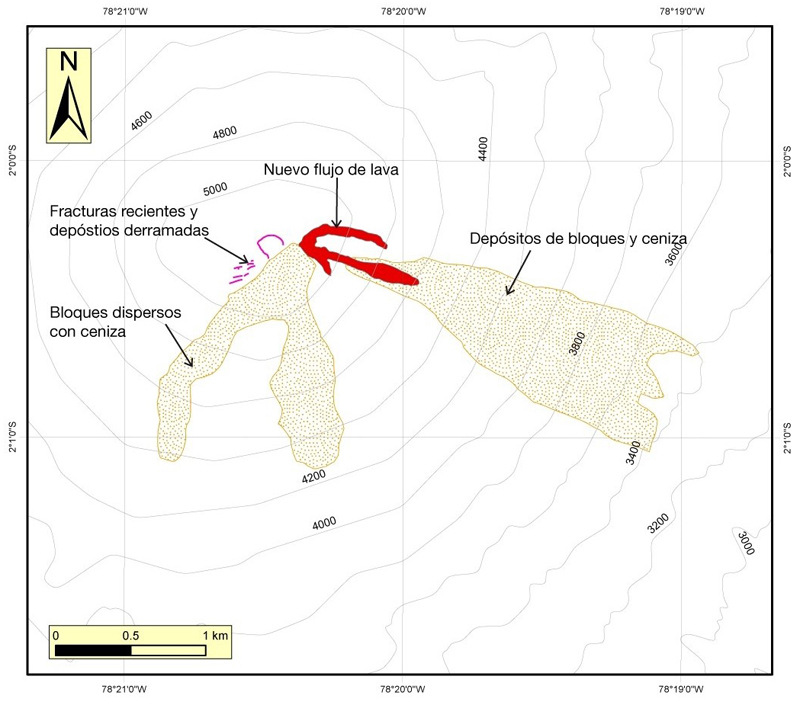 Sangay volcano, Ecuador: structural development, present activity and petrology. J. Volcanol. Geotherm. Res., 90: 49-79. There is no Deformation History data available for Sangay. There is no Emissions History data available for Sangay. The isolated Sangay volcano towers above tropical jungles east of the Andean crest. Seen here from the NE, it is one of Ecuador's most active volcanoes and has been in frequent eruption during the past several centuries. The steep-sided, glacier-covered volcano has been constructed within the older Verdeloma somma to the south. Historical eruptions were first reported in 1628. More-or-less continuous eruptions took place from 1728 until 1916, and again from 1934 until the present. Photo by Minard Hall, 1976 (Escuela Politécnica Nacional, Quito). 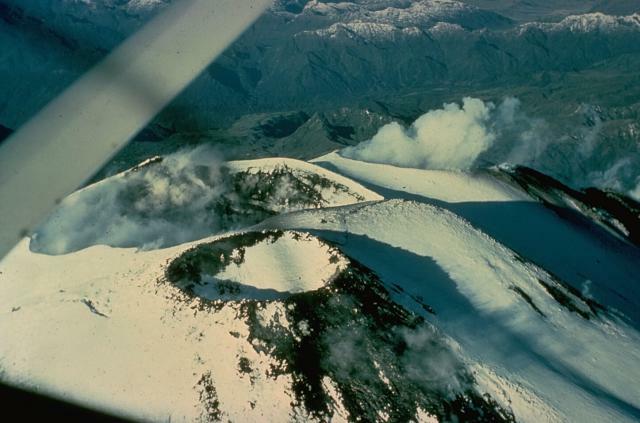 Activity seen in this August 1976 view of the west flank of Sangay volcano is typical of a long-term eruption that began in 1934. An ash plume rises from one of several summit craters. Much of the dark area on the western flank is a shadow, but a dark lava flow can be seen descending the slopes of the volcano. Frequent explosive eruptions and occasional lava flows have constructed Ecuador's most symmetrical volcano. It rises to over 5200-m altitude above the jungles of the western Amazon basin. Photo by Jean-Christophe Sabroux, 1976 (courtesy of Minard Hall, Escuela Politécnica Nacional, Quito). A dark lava flow descends the upper western flank of Sangay volcano in 1976. The lava flow originated from the southernmost of several small craters at Sangay's summit. This frequently cloud-covered volcano is Ecuador's most active. Almost continuous minor explosive activity took place from 1728 until about 1916, and resumed in 1934. Occasional larger eruptions produced detonations heard hundreds of km away. Steam clouds rise above two of three summit craters at Ecuador's Sangay volcano. 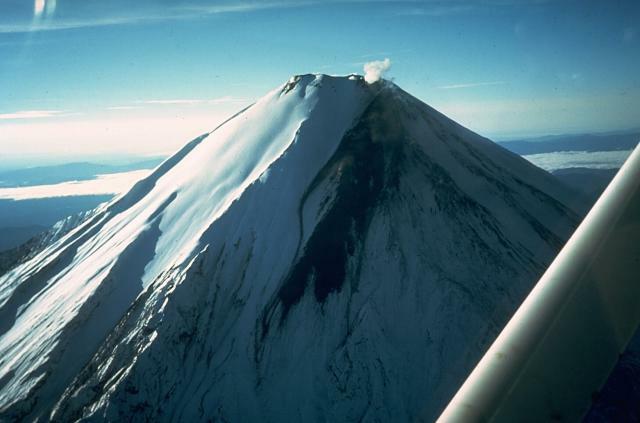 Continual eruptions since 1934 have frequently modified the morphology of the volcano's summit. At the time of this 1976 view from the east, a lava flow from the southernmost crater (right) was descending the western flank. Photo by Gordon Armstrong, 1976 (courtesy of Minard Hall, Escuela Politécnica Nacional, Quito). The Global Volcanism Program has no maps available for Sangay. There are no samples for Sangay in the Smithsonian's NMNH Department of Mineral Sciences Rock and Ore collection. Large Eruptions of Sangay Information about large Quaternary eruptions (VEI >= 4) is cataloged in the Large Magnitude Explosive Volcanic Eruptions (LaMEVE) database of the Volcano Global Risk Identification and Analysis Project (VOGRIPA).